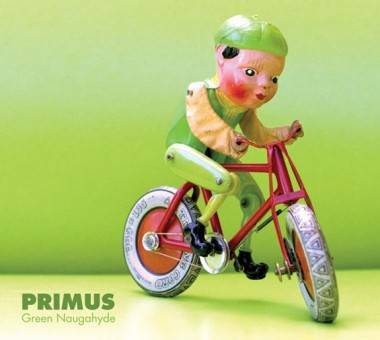 Green Naugahyde – it’s what you’d expect from the perennial freak show-bassist named Les Claypool: eerie and just plain weird. Otherwise, it wouldn’t be Primus after all, would it? It’s been 11 years since Claypool and co. released a full-length album, the last being the mediocre Antipop, before Claypool turned to a half-dozen side projects in the decade to follow. However, it’s been 23 years since drummer Jay Lane and the illustrious bass player have stirred the pot of musical weirdness as Primus. Throw in Larry LaLonde on guitar and vocals and you’ve got a near-original line up. Green Naugahyde is indeed a return to the early days for the trio. Reminiscent of the 1990 release Frizzle Fry, Claypool unearths the organic sound of the band’s early incarnation, though “organic” might not be the right word. In fact, there aren’t many ways to describe what this trio does, except to say they have the ability to consistently freak people out with their genre-bending rock. Claypool, as throughout his career, brings his authentic, slap happy, full on freak-funk bass playing to the table. Combined with his Frank Zappa-esque lyrics, the result is like listening to twisted versions of fairy tales, like “Jilly’s On Smack”. The track, which clocks in at just under seven minutes, is a creepy tale about a tweeked out girl who left home and isn’t coming back. With LaLonde’s simple, trance-like riffs, along with Claypool’s fuzzy, rhythmic heartbeat bass and quiet vocals, the song would be a fitting backdrop to a drug-fuelled movie scene. “Eternal Consumption Engine” carries an element of folk – a foot-stomping, infectious acoustic bassline. This song sounds like a tune you might have heard on Mr. Dressup if Primus wrote the music for the the children’s show. The image of a group of kids waving their arms in the air, hanging out the side of a twisted-looking locomotive isn’t far off here. In his weird way, Claypool’s social commentary on the shoddiness of kids’ made-in-China toys today is lost in the nightmare this song sounds like. “Tragedy’s a’comin”, meanwhile, sounds like Stevie Wonder mismashed with Red Hot Chili Peppers circa Freaky Styley. Anyone who loves Primus will be happy to find the trio reformed and coming at you in full freaked out force. Green Naugahyde is refreshing, and a reinvigorating release for a band one would wonder if they could come out fresh after a decade. Their original style isn’t for everyone, but even those seeking out just a catchy tune may find what they’re looking for on this record. This entry was posted in album reviews, the latest and tagged Les Claypool, reviews. Bookmark the permalink.